Description: This herbaceous perennial plant is 2-3' tall, branching occasionally. The central stem is 4-angled and slightly hairy. The opposite leaves are up to 5" long and 2" across. They are ovate or ovate-cordate, sparingly hairy, and serrated along the margins. The upper surface of each leaf is usually dark green; sometimes the surface of the upper leaves is tinted purple or red. At the base of each leaf, there is a slender petiole up to 1" long that is more or less hairy. The central stem and major side stems each terminate in a single head of flowers. Each flowerhead spans 3-4" across and has several leaf-like bracts underneath. These bracts are often tinted red or purple. The lower bracts are ovate or lanceolate, while the upper bracts are shorter and more linear in shape. Each flowerhead has a ring of several flowers in bloom at the same time. Each flower is about 1½" long, consisting of a 2-lipped red corolla and a tubular calyx. The upper lip of the corolla is semi-erect and tubular in shape, while the narrow lower lip arches downward. The outer surface of the upper lip is often finely pubescent, but it is not conspicuously hairy. The tubular calyx is light green to reddish green and has several veins along its length; there are 5 teeth along its outer rim. Two stamens and a style are strongly exerted from the upper lip of the corolla. The slender style is cleft at its tip. The blooming period occurs during the summer and lasts about 1-2 months. There is no floral scent, although the foliage is aromatic. The flowers are replaced by ovoid nutlets. The root system produces abundant rhizomes. This plant often forms clonal colonies. Cultivation: The preference is partial sun, moist to mesic conditions, and fertile loamy soil. The foliage is often discolored by powdery mildew, although there are disease-resistant cultivars. 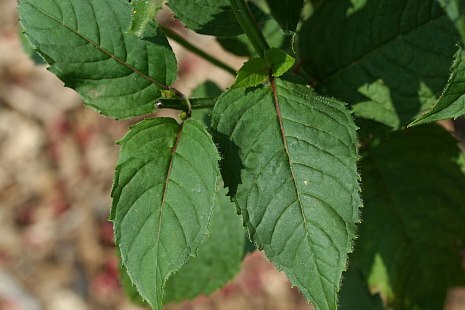 During hot dry weather, there is a tendency for the lower leaves to fall off the stems. Bee Balm is an easy plant to grow, but keeping it in good condition throughout the summer is rather difficult. Range & Habitat: Bee Balm has naturalized in only a few counties in Illinois and is relatively uncommon in the wild (see Distribution Map). However, it is often grown in flower gardens. Bee Balm is native to the Northeastern states, but its original range did not extend as far to the west as Illinois. Habitats include moist open woodlands, woodland borders, thickets, meadows in floodplain areas, and waste areas. Faunal Associations: The nectar of the flowers attracts hummingbirds, Swallowtail butterflies, and probably bumblebees. The caterpillars of various moths feed on Monarda spp., including Agriopodes teratophora (The Gray Marvel), Sphinx eremitus (Hermit Sphinx), and Pyrausta orphisalis (Pyralid Moth sp.). The aromatic foliage of Bee Balm is disagreeable to mammalian herbivores and it is rarely eaten. Photographic Location: A flower garden at the Arboretum of the University of Illinois in Urbana. Comments: The showy red flowers of Bee Balm are quite distinctive. While in the Northeast this species is considered an attractive and desirable wildflower, ecologists in Illinois regard it as a weed because it isn't native to the state. 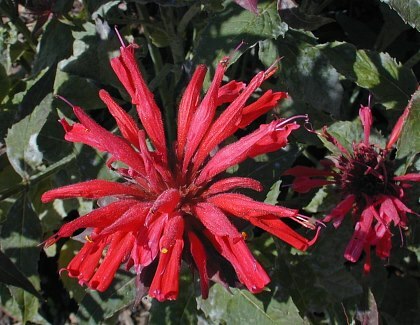 Bee Balm is one of several Monarda spp. that occur in Illinois, but it is the only one with bright red flowers. Compared to the native Monarda fistulosa (Wild Bergamot), the flowers of Bee Balm are slightly larger and less hairy along the outer surface of the upper lip of their corollas. The leaves of Bee Balm are usually a darker shade of green and they are slightly broader than those of Wild Bergamot. Another common name for Monarda didyma is Oswego Tea, which refers to the medicinal use of its leaves by an Amerindian tribe of the same name.